Scams targeting contractors can come in a variety of forms through email, text, and phone. Being able to recognize scams and avoid them (or report them) can help save valuable time and money. There are different types of scams. Some “scams” are from legitimate businesses, but the services they offer don’t always bring the results you expect. These often deal with marketing, lead generation, websites, gaining social media followers, “updating your Google listing”, and more. If it sounds too good to be true, it often is. 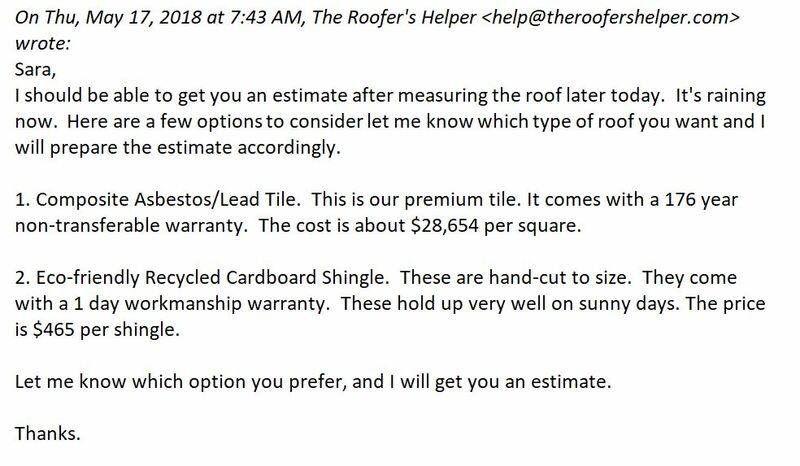 This was sent to my business number, which is found on my ROOFING website. Yes, I am a roofing contractor. Payment details are also available on my website. 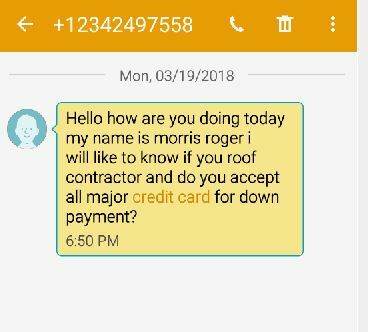 I have received other generic messages asking if I do roof repair. All of the scam messages ask if I accept credit card. Many make a plea for help- they are sick, disabled, are deaf, have an emergency, etc. If you choose to respond, you should be able to determine rather quickly if the request is legitimate or not. You will need to be discerning and not dismiss every cryptic text or email you receive. I have had local customers who had legitimate roofing needs contact me with vague details. Most legitimate customers will give a more detailed description of their roofing needs along with contact information. Phone scams are also becoming more popular. Phone numbers can be altered to show up as local numbers on caller ID. 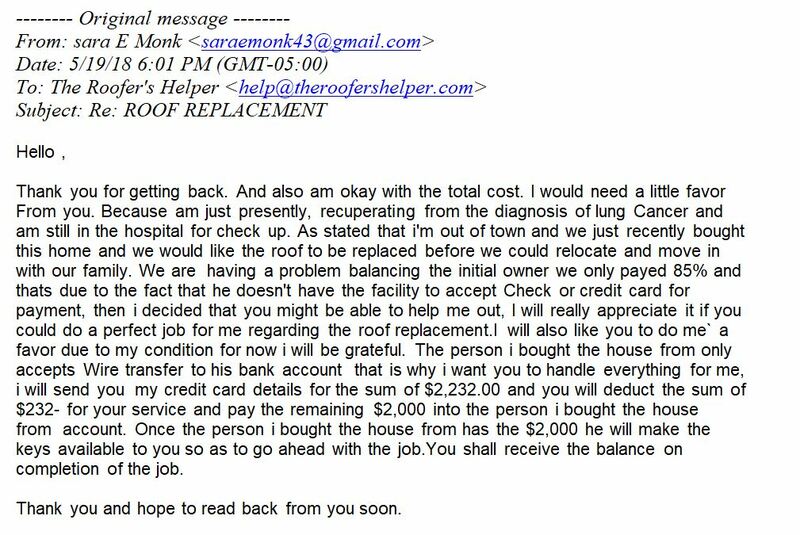 Next, we will document a recent interaction with someone supposedly named “sara E Monk”, who is targeting roofing contractors. Scams similar to this have been reported by local news agencies in the United States and Canada. Some roofers have gone as far as providing full estimates and personal contact details, although I am not aware of any contractors actually losing money through these schemes. Most of the loss is through wasted time and effort in going through the work of providing an estimate and through back-and-forth communications. They just bought a house “around me”. There is a business address on our website. They will use this address to find the house they “recently bought” nearby. While the email is vague, it is understandable why a contractor would respond, at least get more information. 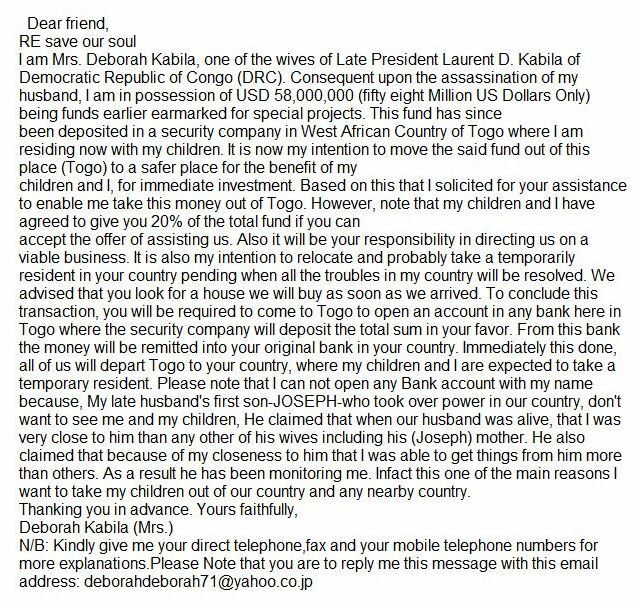 I responded to the first email I got similar to this many years ago. I responded with enthusiasm, including my credentials, but didn’t specify what payments I accept, which is what they really want to know. They immediately get to the mode of payment. This is critical for things to continue. They asked if I accepted check or credit card. Why not cash? What contractor doesn’t like cash? Now that they got an answer to the payment method, they send “the house address”. Their response is obviously cut-and-pasted…3 different ways (different size and type of font)! The house is a legitimate address near me, and is currently for sale. I decided to have a little fun giving some options before providing and estimate to see how they would respond. (It was raining while I was writing- that part was true). You will notice throughout these email interactions that the scammer tries to stick with a script. They rarely respond naturally to what I have written, which is obviously ridiculous. My thoughtful and creative options for their roof replacement are ignored. They want me to give a price so they can move ahead with the scam. I finally got that roof measured up and asked them which option they wanted. I thought the conversation would end here when they looked over those roof options again. They want a metal roof??? That wasn’t one of the choices! As all roofers know, metal is a horrible choice for roofing. I already gave two premium choices. Pick one already! Time for me to cut and paste. Well, they researched the options and finally decided to go with the “combestors”. “Combestors“??? We all know the customer is always right. If they want combestors, we give them combestors. To mix things up, I offered to coat the whole roof for a bargain price of $232.89. I think I shocked them with my affordable pricing. I low-balled the price because I didn’t want to lose the job to a competitor. DON’T FORGET THE 89 CENTS!!! They got the method of payment and a price confirmed. Here comes the pitch. Oh, they need a favor! Lung cancer…hospital…out of town…having a problem…need help. I had to go get a box of tissues. A side note: It looks like they got an incredible deal on this house! They said they already paid 85% and that they now only owe $2,000 more. If my math is correct, that would mean that the purchase price of the house is approximately $13,3333.00. The current listed asking price was almost $240k! This is a perfect example of one of the classic schemes. The scammer will overpay you, and then ask you to wire the difference somewhere. The money they send won’t clear the bank, or may be from a stolen credit card. You end up losing any money you send. Although it is rare, people have fallen for this. Don’t be that person! I don’t agree to the scam, but do call them out on cheating me of $0.89. I mean, come on! They ignore my response and want confirmation that I agree to be suckered…I mean agree to help them. Ok, I don’t want to be too cold-hearted. I’ll help. I’d rather not give my phone number to you. Can’t we do this through email? Oops. I think they started to cut and paste the first email again…and accidentally hit “send”. Do I have to start this whole conversation over again?? Ok. I will if I have to. Guess they didn’t like the content of my last email. Ignored. They are still pressing for my contact info, and of course they want to know I will do a very good job. I’m getting tired of this and kindly send an email address where they could continue the dialogue. This is the email address the Federal Trade Commission provides to report deceptive emails. They ignore me and appear to be getting frustrated. Is that anger or disappointment? Maybe they’ll communicate with our Billing Coordinator, Ima Spam. Guess they aren’t interested in dealing with Ima. Last email I sent. Haven’t heard back. Either they decided to contact Ima, or they have given up. As you can see, these scammers are very persistent, but also very scripted. It’s amazing that the conversation lasted as long as it did. Perhaps some scammers are better communicators than others, making the scam harder to detect. An optimistic person (who only sees the good in others), a generous person, or a contractor desperate for customers, may all be more susceptible to falling for something like this. There’s not a whole lot that can be done other than ignore and/or report these scammers. If you choose to interact with a scammer, do it at your own risk. You may possibly be dealing with someone who won’t appreciate you doing to them what they are trying to do to you.